Trump represents a serious risk to the interests of corporate America. Trump expected adulation from the corporate community for his deregulation efforts, however, they are increasingly seeing him as the harbinger of risk. Trump not only poses a serious risk to the world's ability to reign in climate change, recent research indicates that corporate America thinks that he also poses a risk for them. Trump's climate ignorance has been repudiated by Corporate America. Trump does not reflect the interest of the business community. Most global firms are premised on a fundamentally different world view than the one contained in Trump's insular nationalism. Even the fossil fuel industry has been increasingly distancing themselves from Trump. As reported by Axios, "the biggest and most important U.S. energy companies are now dropping their resistance to a global climate deal." Corporate America has come a long way since Trump was elected president. During the campaign they remained largely silent so as not to risk alienating people. Now they are increasingly standing up and challenging Trump outright or quietly resisting by adopting sustainability focused strategies. 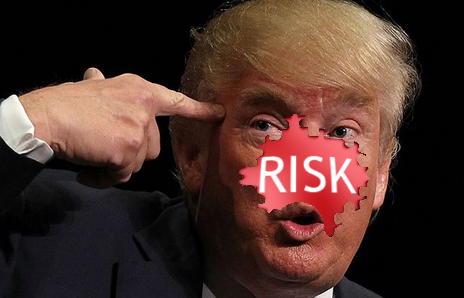 Trump is increasingly being seen as a corporate risk factor. According to Triple Pundit's Leon Kaye, the financial data research firm Sentieo reported that the corporate Securities and Exchange Commission (SEC) have received several hundred filings related to Trump. These filings reflect concerns about the impact on performance and stock prices related to financial regulations, energy policy, and healthcare reform. More than seven years ago the SEC issued new interpretive guidance that clarifies the climate-related information that publicly traded companies need to disclose. This includes things like emissions management policies, physical impacts of changing weather and green economy business opportunities. In 2013 we saw a big wave of sustainability and climate focused resolutions from shareholders. This spring Kraft Heinz shareholders put forward few sustainability motions ahead of a shareholders meeting. Sustainability related to SEC filings have increased rather dramatically since the election of Trump. These resolutions see Trump as a risk factor. As reported in the Wall Street Journal Trump was mentioned in securities filing ten times more than his predecessor President Barack Obama. In the context of arguably the worst 100 days in American presidential history, more and more businesses are realizing that they have too much at stake and they must take sides.